Not for everyone. Maybe you *shouldn’t* do it. I think it is important to remember that leaving traditional employment to pursue self-employment isn’t for everyone. That is something only you know, so be honest with yourself and be sure to choose something you truly love. Just escaping a job that wasn’t what you expected might be better done by simply finding another job in your same (or similar) field. It could be that self-employment doesn’t fit you anyway. Are you motivated to get things done yourself or do you need someone to direct you? One thing that helped me was to think about the worst case. Depending on your circumstances, I believe this could either encourage or discourage a person from making a change. Remember to be honest with yourself. In my case, I decided that the absolute worst case was having to sell the farm and find another job in my field. While this would be a huge setback both financially and likely career wise, it was acceptable to us. It is important to consider what motivates you to consider this change. It could be that there is a much simpler, less risky way to achieve what you are looking for. 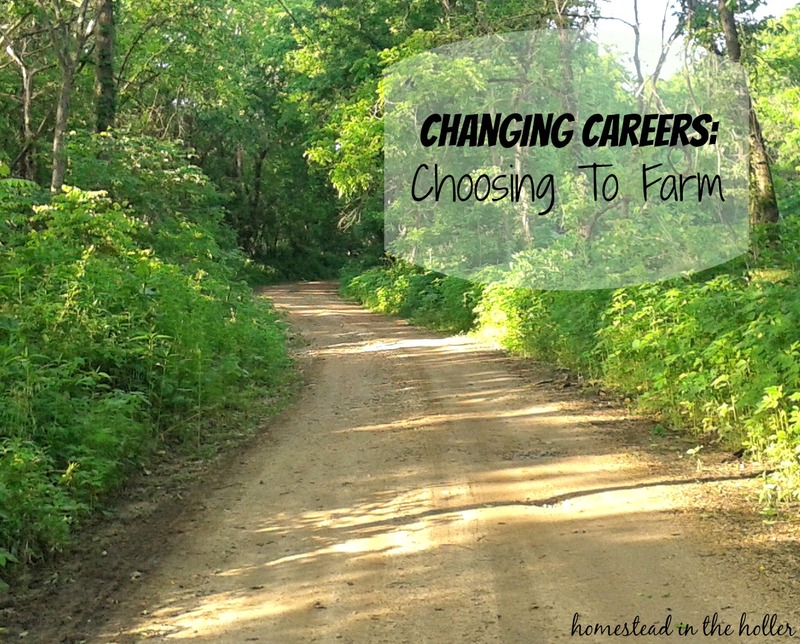 In my case, a career change felt like the necessary step, because I love the whole idea of farming WITH nature. It is something that excites me and that means it is easy to spend time doing. If that changes, it will be time for another change. I think this is very important. We talked about our adventure for many, many years. We saved, we planned. We considered what was important to us and that helped us choose where. In fact, we considered all 50 states and even some other countries and rated each state for the things we cared about. I think jumping into this sort of thing likely wouldn’t be pretty. Our choice for career was agriculture, which can look so appealing from the sofa, but isn’t quite so glamorous in real life. It involves hard work, long hours and sometimes big disappointments. So, remember to plan and again, be realistic with yourself. Consider the work involved and then at least triple those estimates and plan again. Starting a farm is a huge undertaking. It takes time, money and lots of work. Remembering that time is money, that list becomes money, money and lots of work. Most painful of all, most agricultural products take quite a lot of time to produce (think beef, etc). Many take a whole lot of time, such as our orchard. Keep this in mind while planning, so you can undertake some shorter term projects that produce an income more quickly, such as vegetables, bushes, sheep and pigs. Remember that you will likely live for quite some time with no or minimal income. Be willing to take an outside job if need be. Try to reduce expenses as much as possible to slow the burn of money. It is most likely that your plan won’t work out quite like you envision. In fact, most things seem to go quite a bit differently than expected. It is even likely that things might not work out at all. Things might not feel right. Whatever it is, what happens at that point? This isn’t something we have put huge amounts of effort into, but there is a list of options there, such as finding a local job, finding more contract work in my field of engineering, and so on. Be willing to make changes as needed. Hold to your principles, but be willing to bend them to get to where you want to be. I have a hard time with this, but sometimes it is better to get started with something rather than waiting to start at the ideal point (analysis paralysis). An example for us is pigs. We are currently raising pigs in roughly the manner we want, but aren’t moving them as often as we’d like. We aren’t feeding them the diet we’d really like (mostly grown on site or more locally). We don’t have all the infrastructure in place that we need. However, we are managing to raise pigs now and to get a start. We will continue to improve as we go. Eventually we will either reach our goal or we will stop raising pigs, whichever feels right. It really is easy to over extend yourself. In our case, we often end up getting too many trees/bushes to plant than really fits our available time. It is always tempting to take on just one more animal or one more garden bed. Just be realistic about your available time. If (when) you do reach the breaking point, be willing to let something go. We learned in grazing school that holistic management stresses the importance of lifestyle as well as animal wellness. When you take too much on, both animal wellness and life balance are likely to suffer. PLAN for animals. PLAN your farm. We’re back to planning again. I think I emphasize this because I’ve failed so many times. Permaculture design has been a great help for me, because planning/designing is such an important part. When you choose to bring in an animal, be sure to plan for its arrival and understand what is really necessary. This may seem like a contradiction of being flexible, but I don’t think so. Make sure to be able to at least hold and feed animals, even if it isn’t what you’d ideally like. Getting animals without the proper preparation is a recipe for disaster and annoyed neighbors. Sometimes it is hard to pass up a great opportunity, but it isn’t worth the headache of not being prepared. Likewise, be sure to plan out your farm. Consider not building permanent fences immediately. As you use your land, you’ll start to get a feel how you would like things to flow. Being hampered by something you built at the start that you now hate isn’t pleasant. Focus on perimeter fences and build interior fences later. Consider using mobile buildings whenever possible so you aren’t locked into any particular layout. We have found that moveable shelters are a huge help with livestock. If you use black HDPE water pipes, they can be placed above ground until you are sure they are right where you want them, since they are UV stabilized. Once you are ready to commit, you can trench them in. Keep track of ACTUAL expenses, etc. DO track your hours. You will probably hear again and again that a farmer can’t keep track of his hours. I strongly disagree. I always keep track (at least roughly) of my time invested in a project. If you look back at a project and find that it only generates say $2/hour and isn’t likely to improve, this is something you should get rid of. There are many, many things to do, so focus on things that *do* pay. Also, keep track of inputs. Without this, you will never know if you make or lose money when you sell eggs for $2/doz or pork chops for $3/lb. I realize that it can be hard to keep good records, because I often don’t do as good of a job as I’d like. However, you will be glad for good records later. Also be sure to track animal events such as births, weaning, etc. It’s amazing how hard it is to remember later. You aren’t going to be an expert at everything when you start your new endeavor. While farming certainly takes a wide range of expertise, there are things you won’t know. Some days I feel like there isn’t anything I *do* know. Seeking help from an attorney when setting up your business just may save you thousands later. Consulting a CPA is likely to pay off quickly, especially if it prevents compliance issues with the government. An artist can make your business look much more polished and make marketing that much easier. Take classes, read, talk to people, watch people. There is just so much to learn. Take some classes and make sure to read whatever you can. Then, read some more. I am always finding new, interesting processes that others are trying. Sometimes this may help you to generate still new ideas to try. Make sure to talk to people, even those that do things in a way you don’t agree with. You are an adult, so I trust you can filter out the parts you don’t like. Most likely you can pick up all sorts of ideas from older farmers that have already encountered much of what you’ll see. Watch what others are doing. There is always room to learn. Be prepared for setbacks. There will be things that happen that make you doubt yourself and doubt your choices. These things can be trying for sure, but try to keep a view of the bigger picture. Remember that even mistakes can be valuable if you learn from them. If you do something poorly, resolve to do it better next time. Be prepared for those who say you are crazy or stupid or will regret your decision. I’ve certainly encountered all three. If this gets to you, you might want to consider not going for the change. There is nothing wrong with the comfortable, known path. Or it could be that you’re like me and it’ll just strengthen your resolve and you’ll just say “well, there is only one way to find out”. If you do decide to go for it, have fun! Do the things you are passionate about. Enjoy life! Slow down. Don’t let the little things get you down. And please share your experiences. This entry was posted in Farm Life, Homesteading, Moving and tagged career change, changing jobs, get started farming, moving to homestead, starting a farm. Bookmark the permalink. This is neat! We always enjoy hearing about your experiences. You have more nerve than we do as we waited until we had a secure retirement before we made the move “back to the farm”. We are now enjoying living in Douglas County and feel live we are back home (or at least I do). Mary has adapted very from a St. Louis City girl to a real Douglas County person. We have a trail ride every day this week as the Spring show is underway. We had lots of high water this past week end. Mary had her family down and they experienced our “river”. I hope to see you Sunday. Being self employed is challenging but both my husband and I would agree: we wouldn’t want it any other way 🙂 This is a very well thought out list! This is so great! A year ago, I switched from being an Extension Agent to staying home with the kids/and working on the farm. It was quite an adjustment and I thought it would be easier for sure. But it has all been worth it. I think many people struggle with this and need to read your story. I’m sharing this with my Facebook Readers today. Thanks for posting it! Thanks for the kind comments, Mindy. That’s great on your adventure — glad to hear it is working out for you. Thanks for sharing! Great article, Travis! Had to smile reading about the doubters and the nay- sayers because you had plenty of those! You have worked hard and learned a lot but there’s plenty of evidence you are totally loving what you are doing, even with all the hard work! Failures? Every new adventure has a few of those but your well thought out plans have avoided huge failures! Keep on enjoying your new adventure!